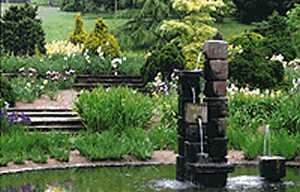 Beaujoire Park was created for the 1971 Floralies flower show. The monumental fountain, one of the largest in Europe, presides over events staged there. To the north, the12 hectare (30 acre) Parc Floral is specifically devoted to landscaping and gardens. The park was originally a mere assembly of various displays, but over the years it has been enlarged and redesigned to make a whole. In spite of this, it offers great diversity of planting and vistas. The Bretonnière stream runs through a valley where rock gardens built on the old quarries are mirrored in two pools. The Iris Garden has been built as an amphitheatre so that all the flowers in the collection can be appreciated in one glance. The Heather Garden is designed as a chequer-board to exhibit 65 varieties with attractive flowers and foliage. The western end of the plateau was planted with many different species and varieties of perennials for Roc Flor 77 flower show. However, the main part of the plateau is taken up by the Rose Garden which includes 25,000 rose bushes 1,500 varieties. They are arranged in 31 enclosures and include shrubs and perennials so that the garden remains attractive all through the year. The Biennale Internationale de la Rose Parfumée (the Biennial International Perfumed Rose Show) is held every other year in the oval enclosure on the banks of the Erdre. Finally, visitors can admire the National Collection of magnolias that are planted along the paths.